St. Martin's Press, 9781250135995, 240pp. Toni Morrison hails Tears We Cannot Stop as "Elegantly written and powerful in several areas: moving personal recollections; profound cultural analysis; and guidance for moral redemption. A work to relish." Stephen King says: "Here’s a sermon that’s as fierce as it is lucid…If you’re black, you’ll feel a spark of recognition in every paragraph. If you’re white, Dyson tells you what you need to know—what this white man needed to know, at least. This is a major achievement. I read it and said amen." 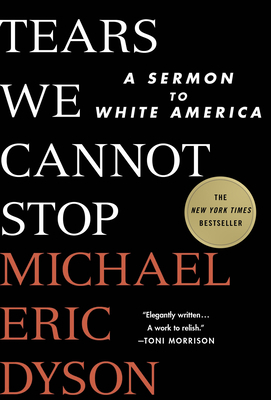 Short, emotional, literary, powerful—Tears We Cannot Stop is the book that all Americans who care about the current and long-burning crisis in race relations will want to read. As the country grapples with racist division at a level not seen since the 1960s, one man's voice soars above the rest with conviction and compassion. In his 2016 New York Times op-ed piece "Death in Black and White," Michael Eric Dyson moved a nation. Now he continues to speak out in Tears We Cannot Stop—a provocative and deeply personal call for change. Dyson argues that if we are to make real racial progress we must face difficult truths, including being honest about how black grievance has been ignored, dismissed, or discounted. "The time is at hand for reckoning with the past, recognizing the truth of the present, and moving together to redeem the nation for our future. If we don't act now, if you don't address race immediately, there very well may be no future." MICHAEL ERIC DYSON is one of America’s premier public intellectuals. He occupies the distinguished position of University Professor of Sociology at Georgetown University, is a contributing opinion writer for the New York Times, and is a contributing editor of The New Republic and ESPN’s The Undefeated. Ebony magazine named him one of the 100 Most Influential African Americans and one of the 150 most powerful blacks in the nation. "Michael Eric Dyson is alive to the fierce urgency of now and yet he's full of felicitous contradictions: an intellectual who won't talk down to anyone; a man of God who eschews piousness; a truth-teller who is not afraid of doubt or nuance; a fighter whose arguments, though always to the point, are never ad hominem. We can and should be thankful we have a writer like Michael Eric Dyson is our midst." —Dave Eggers, from the preface of Can You Hear Me Now?